Modern and Contemporary is easier on the body than ballet because it uses natural movement and is adaptable to the individual's physique. Modern movement comes from the trunk, midsection, back and strong abdominal support is very important. Modern explores different ways of moving, body swings and bounces, on and off balance, with variable timing. Modern dance teaches use of space in relationship to centering the body's position, rhythm and musicality. 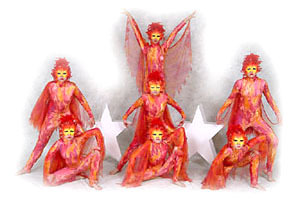 It is based in ballet and related to the improvisation forms of popular social dance.